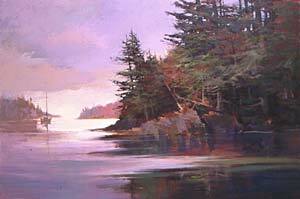 "Slack Tide on the Sasanoa"
Maris Platais was born in Latvia and has lived in New England since 1949. He is a graduate of Tufts University and The Museum School of The Museum of Fine Arts, Boston where he later became a member of the faculty. 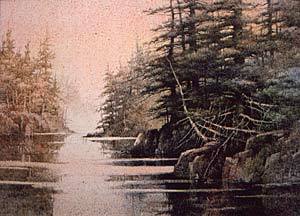 He lectures and demonstrates to art associations throughout the northeast. 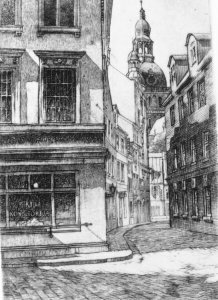 He is a member of The Guild of Boston Artists where he has had several one-man shows. He has received several awards for excellence in the Mystic International Competition and also Top 100 Competition, Arts for the Parks, Jackson Hole, Wyoming. In 1996 and 1997, he received the Honors Award in Graphics from The Academic Artists Association, Springfield, Mass. The American Society of Marine Painters has awarded him membership and he is past President of The Concord Art Association, Concord, Mass. Platais is well known for his acrylics on canvas, pen & inks and limited edition etchings of New England landscapes and boats. 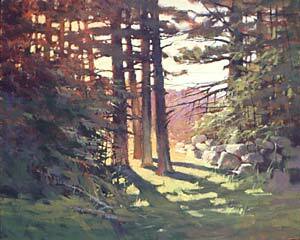 Many of his fine works depict Kenebec, Maine and the magnificent trees that surround his studio near Concord, Mass. He paints in every season on location, but the blazing colors of his autumn scenes are treasures.